I volunteered to help setup for a band contest at Whitford Middle School. I watched as the band director ran through her list, sending volunteers out to do various tasks. Then, when everyone was busy, she jumped into the fray herself. The thank you I wanted to write tonight. An hour later, I was standing behind the beverage sales table at Conestoga Middle School for Family Fun night. I watched as the principal roamed the event, cleaning up, talking to parents, and pitching in with whatever was needed. It never ceases to amaze me how the dedicated administrators and teachers in my children’s schools put in the extra hours and always chip in wherever help is needed. They are always doing double duty. At the end of the evening, many hours later, my wife and daughters and I packed up our sodas and waters, cleaned up our station, and went home. My legs hurt from standing for so long. Yet, I know that a little pain for my few hours of volunteer time really pales in comparison to what our school staff does every day. Ironically, I was asked to change the reader board tonight. “Thank you to our wonderful volunteers,” it said. Today’s gift of time … Pulled double duty volunteering at two schools tonight. The same double duty that our school’s teachers and administrators do everyday. 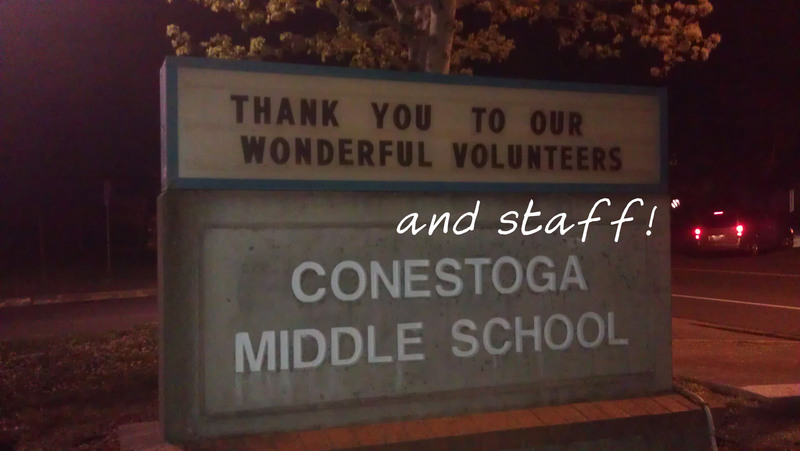 This entry was posted in In the community and tagged Children, Conestoga Middle School, double duty, Giving Our Time, giving time, middle school, schools, Volunteering, Whitford Middle School. Bookmark the permalink.